The team behind Fruit Ninja and Jetpack Joyride unveil its next big game. Mobile gamers are familiar with Halfbrick, the studio behind popular releases like Fruit Ninja and Jetpack Joyride. Today, the company revealed its latest project, a collaboration with Australian developer Six Foot Kid. 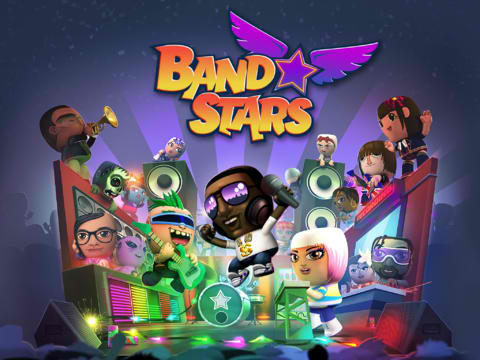 In Band Stars, players will put together their dream band, selecting from a number of colorful, interesting characters, each with their own special skills. From there, they'll come up with a great name for their band and hit the recording studio, where they'll try to make it big with small releases on the Local Charts before shooting for loftier goals - in this case, becoming the biggest band in the world. Featuring a full training system, character and band challenges, and the ability to design your studio however you see fit, Band Stars definitely looks like a winner. The free-to-play game is available for download now in Canada and Australia, and will be released in other App Store markets later in the year.